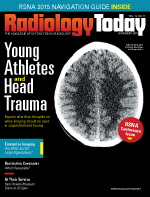 As the father of current and former soccer players, I read Keith Loria's article about young athletes and imaging head trauma on page X with great personal interest and experience. In the past nine consecutive seasons of high school and college soccer—plus too many club soccer games to count—I've dealt with head trauma three times. My now 22-year-old son was a sophomore in high school when our school district introduced ImPACT testing to manage potential concussions. All players in contact sports all were required to have baseline tests and those scores were kept on file. After his initial head-to-head collision involving "concussionlike symptoms," my son was sidelined until he had been symptom-free for one week, his ImPACT test score was back at baseline, and his pediatrician signed off his returning to the lineup. He had some dizziness, a headache, and a bump on his head, but did not lose consciousness. The pediatrician did not think a CT scan was necessary unless symptoms took a turn for the worse. Looking back, that imaging decision aligns with the guidance in the Canadian Head CT Rule and the Pediatric Emergency Care Applied Research Network guideline mentioned in Loria's article. Since that first incident, I've been the worried parent in two more situations, one requiring a CT scan and one not. One comforting thing—about the only one—was understanding that there really were policies and procedures in place among the school administration, coaches, athletic trainers, and local physicians. In the absence of that structure, most parents insist on "doing something" in these situations, which too often leads to questionable imaging that mostly just treats parental anxiety. I believe the trauma imaging guidelines—and publicizing the process—helps. To be sure, clinicians will always face pressure from some parents to scan, even though the doctors strongly believe it's not necessary and needlessly exposes a young person to radiation. On the recovery side, ImPACT testing is not a complete solution. Research has questioned its reliability, with one study suggesting that it produces a significant number of false positives. My response to that: Don't let the perfect become the enemy of the good. ImPACT testing-based policies such as the one my school district uses put a third party between a kid getting hit in the head and going back out on the field. That is good, because in case you haven't been to a high school or other sporting event involving young people, adults can get a little stupid when it comes to youth sports. Enjoy the issue. I hope to see many of you at RSNA's 100th anniversary in Chicago. Stop by booth 8044 when you're in the north exhibit hall.